Style comes in all shapes and sizes. With Volume Apparel’s trendy wholesale plus size clothing for women, your customers will be able to shop style and fashion. Looking good is about knowing what colors and fits best accentuate your physique. We only offer the best styles for your customers. Plus sizes can be as flashy and comfortable as anything you see on a runway model. Here at Volume Apparel, we have popular brands from top name designers. Each has put their talent into perfecting a look that’s going to do what clothes are supposed to- make you feel and look good. Volume Apparel’s affordable plus size women’s wholesale clothing collection of bottoms, outerwear, and dresses are promised to fly off your store’s shelves. Famous Brand ladies Plus Size chiffon tank top. 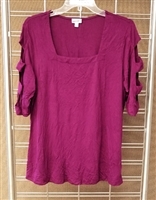 Famous Plus Store ladies cut out sleeve top. Mille Gabriel plus size sleeveless trapeze dress. She's Cool plus size printed shirt dress. Famous Brand plus size knee length dress. Northwest Blue plus size ladies’ base layer 2 piece thermal set. Optimum Customer Service – Volume Apparel always puts the customer first and because of this mentality, has grown year after year. We’re available to help by phone or email if you have questions or need help placing an order. Same Day Shipping – When you need your shipment of wholesale plus size clothing for women as soon as possible, Volume Apparel has you covered. Our warehouses are always fully stocked so we can fill your orders. If you place your order before 12pm EST, you’ll get same day shipping! Give us a call today at 1-800-933-9668 to learn more about ordering wholesale women’s plus size clothing online at Volume Apparel.